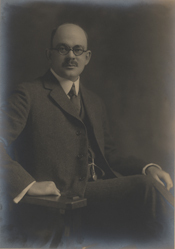 ROGERS, John Jacob, (husband of Edith Nourse Rogers), a Representative from Massachusetts; born in Lowell, Middlesex County, Mass., August 18, 1881; attended the public schools, and was graduated from Harvard University in 1904 and from the law department of that university in 1907; was admitted to the bar the same year and commenced practice in Lowell in 1908; member of the Lowell city government in 1911; school commissioner in 1912; elected as a Republican to the Sixty-third and to the six succeeding Congresses and served from March 4, 1913, until his death; during the First World War enlisted on September 12, 1918, as a private with the Twenty-ninth Training Battery, Tenth Training Battalion, Field Artillery, Fourth Central Officers' Training School, and served until honorably discharged on November 29, 1918; died in Washington, D.C., March 28, 1925; interment in Lowell Cemetery, Lowell, Mass. Papers: In the Edith Nourse Rogers Papers, ca. 1854-1961, 11 linear feet. Subjects include John Jacob Rogers.